How many boxes does it take to pack your life up to move from one country to another? Good question. I'm hoping the answer is less than 10. Because I'm consumed with moving and packing right now, I thought I would FINALLY share my beloved lentil sloppy joe recipe with you. I came up with it last winter and ever since, we've been enjoying it on a weekly basis during the colder months. Since winter is unavoidable (and coming soon! ), I thought now would be as good of a time as ever to make sure you're prepared with this recipe so you, too, can make it as often as you need to! 1. In medium pot, cook lentils (rinse and add 1 cup dry lentils to 2.5 cups water, bring to a boil, then cover and turn down to low and let simmer until cooked. Set aside until ready to add to sloppy joe mixture). 2. Meanwhile, in a LARGE pot, over medium-high heat, add EVOO/coconut oil along with garlic and onion to pot. Let cook for a few minutes. 3. Next, add in spices (chili powder, cumin, and paprika) and mix until it turns really dry, then add in canned tomatoes (tomatoes PLUS all the juice in the can). 4. Then, add in chopped veggies along with tomato paste, apple cider vinegar, brown sugar, and ketchup. Stir to combine. 5. Bring to a boil, then reduce heat a bit, cover, and let simmer until veggies are tender. 6. Once veggies are tender, add in cooked lentils, and combine. Cook for a few more minutes until lentils are heated through. 7. 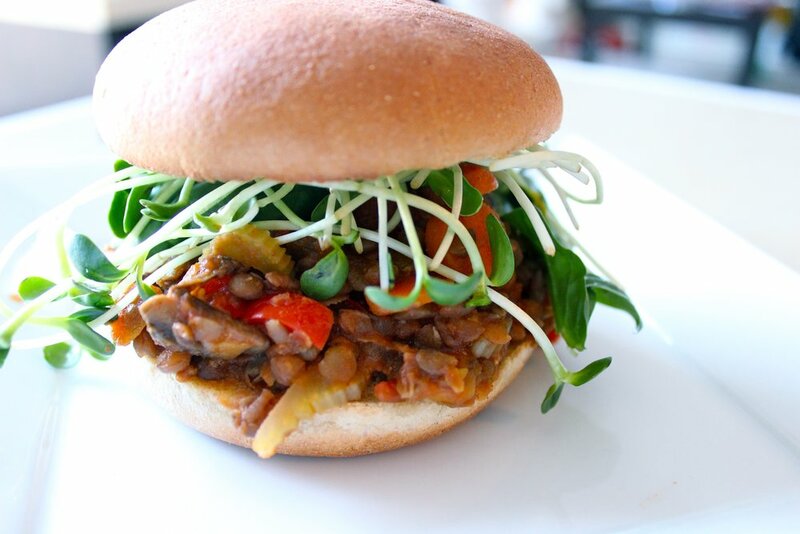 Serve on a sprouted grain bun with spinach and sprouts, if desired. 8. Enjoy the heck out of them, but don't burn the roof of your mouth like I normally do when I bite into them, haha! I can't help but add a bunch of greens on top of my sloppy joe mixture (like spinach and sunflower sprouts), but feel free to omit if you don't fancy the extra fixings! Or if you prefer, slather it in hot sauce (next on my list to try)! Or just enjoy, as is. I would do that, too. And then come help me pack. The kitchen is on my agenda for today. You know you're up for wrapping all breakables up in newspaper! What's a tedious job you try to avoid at all costs? If you could move anywhere in the world right now, where would it be?